InfluxDB is an open-source time series database written in Go. Optimized for fast, high-availability storage and used as a data store for any use case involving large amounts of time-stamped data, including DevOps monitoring, log data, application metrics, IoT sensor data, and real-time analytics. Telegraf is an agent for collecting, processing, aggregating, and writing metrics. It supports various output plugins such as influxdb, Graphite, Kafka, OpenTSDB etc. 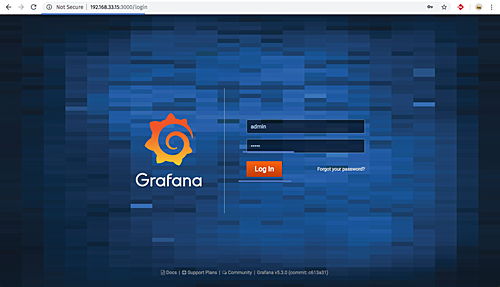 Grafana is an open source data visualization and monitoring suite. It offers support for Graphite, Elasticsearch, Prometheus, influxdb, and many more databases. 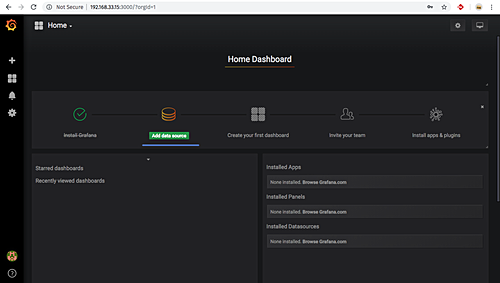 The tool provides a beautiful dashboard and metric analytics, with the ability to manage and create your own dashboard for your apps or infrastructure performance monitoring. In this tutorial, I will show you how to install and configure the TIG Stack (Telegraf, influxdb, and Grafana) using a single Ubuntu 18.04 Server. We will be using the TIG Stack for monitoring the system loads such as Network, RAM Memory, Uptime etc. In this first step, we will install the time series database influxdb on the Ubuntu system. We will install both 'influxdb' and the 'telegraf' from the same 'influxdata' Repository, both software were created by the same organization. Now update the repository and install the 'influxdb' package using the apt command below. After the installation is complete, start the influxdb service and enable it to launch every time at system boot. Now check the opened ports on the system. And make sure you get influxdb ports '8088'and '8086' on the 'LISTEN' state. In order to store all data from telegraf agents, we need to set up the influxdb database and user. 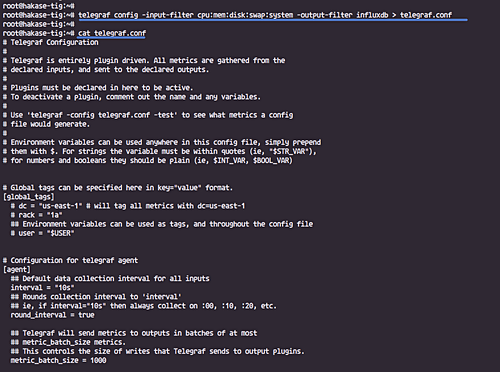 InfluxDB provides the CLI tool named 'influx' for interacting with an InfluxDB server. Influx command is like the 'mysql' on MySQL, and 'mongo' on the MongoDB database. Run the 'influx' command below. Now you are connected to the default influxdb server on port '8086'. 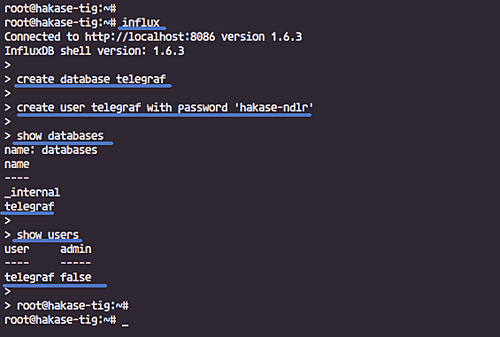 Create a new database and user 'telegraf' with the password 'hakase-ndlr' by running influxdb queries below. Now check the database and user. Make sure you get the database and user named 'telegraf' on the influxdb server. Telegraf was created by 'influxdata', same organization which created the influxdb. So when we add the influxdata key and repository to the system, it means we can install both applications. 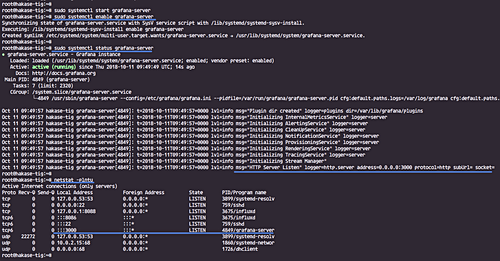 Install the telegraf package using the apt command below. After the installation is complete, start the telegraf service and enable it to launch everytime at system startup. The telegraf agent is up and running, check it using the command below. Telegraf is a plugin-driven agent and has 4 concept plugins type. Using the 'Input Plugins' to collect metrics. Using the 'Processor Plugins' to transform, decorate, and filter metrics. Using the 'Aggregator Plugins' to create and aggregate metrics. And using the 'Output Plugins' to write metrics to various destinations, including influxdb. In this step, we will configure the Telegraf to use basic input plugins for collecting system metric of the server and using the influxdb as the output plugin. Go to the '/etc/telegraf' directory and rename the default configuration file. Now create a new other configuration 'telegraf.conf' using vim editor. Telegraf provides telegraf command to manage the configuration, including generate the configuration itself, run the command as below. Restart the telegraf service and make sure there is no error. Now test the telegraf settings using the command below. The InfluxDB and Telegraf configuration has been completed. In this step, we will install the beautiful Grafana Dashboard for data visualization. Add the grafana key and repository. Update the repository and install the grafana package using the apt command below. 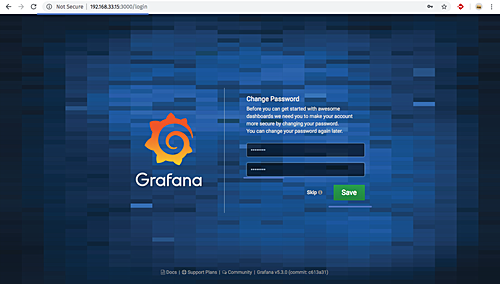 After the installation is complete, start the grafana service and enable it to launch everytime at system boot. The grafana-server is up and running on default port '3000', check it using netstat. And you will get the result as below. Open your web browser and type the server IP address with port 3000. Login with the default user 'admin' and password 'admin'. Now you will be prompted with the page for changing the default password, type your new password and click the 'Save' button. And you will be redirected to the default Grafana Dashboard. Click the 'Add data source' button to add the influxdb data source. Type details about the influxdb server configurations. 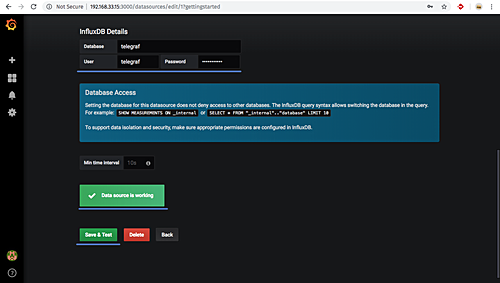 Scroll to the bottom page and type details of influxdb database settings. Click the 'Save and Test' button and make sure you get the 'Data source is working' result. 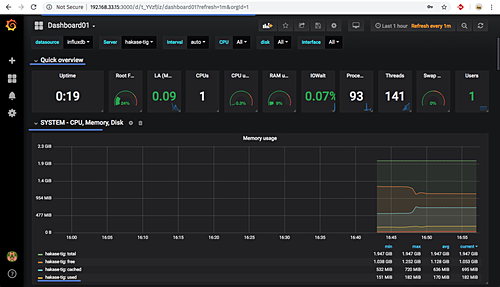 The InfluxDB data source has been added to the Grafana server. 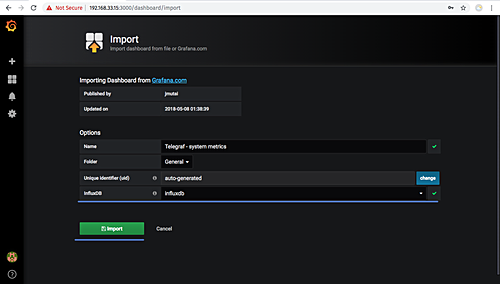 After adding the influxdb as a data source to the grafana server, in this step we will import the grafana dashboard based on our Telegraf input plugins setup. Grafana provides the repository for grafana plugins and dashboards. 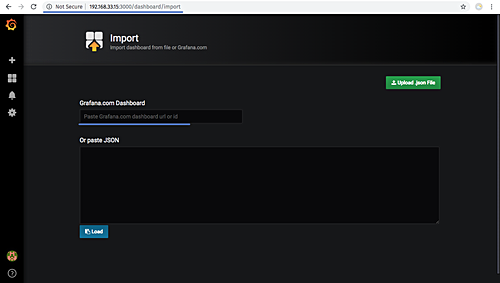 To import the grafana dashboard, click on the '+' menu on the left panel and click 'Import'. Now open the sample Grafana dashboard from URL 'https://grafana.com/dashboards/5955' and click the 'Copy the ID to Clipboard' button. And you will be redirected automatically to the dashboard setup. On the options section, click the InfluxDB and choose your influxdb server, then click 'Import' button. And below are some screenshots from the imported dashboard. 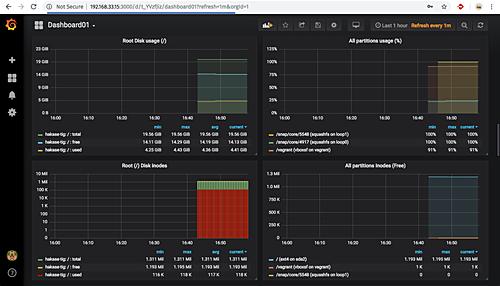 The TIG Stack (Telegraf, InfluxDB, and Grafana) installation on Ubuntu 18.04 has been completed successfully. Hi! This works wonderfully, however the 'net' test command for telegraf returns 'Error: no inputs found, did you provide a valid configuration file?'. How can I resolve this issue? Thanks again for the wonderful guide! 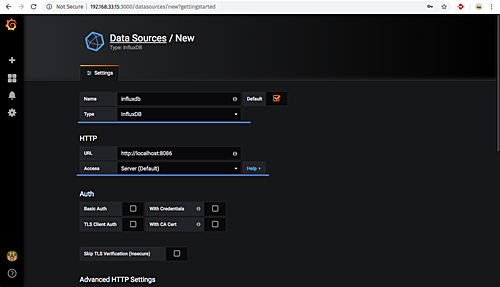 Your website is very helpful and one of the best website in open source ,,,but i need install telegraf , grafana and influxdb in docker and visulise graf so if possible please upload process..
Grafana has moved their repository... here's there notes. Create a file /etc/apt/sources.list.d/grafana.list and add the following to it. Use the above line even if you are on Ubuntu or another Debian version. Then add our gpg key. This allows you to install signed packages.